A uniquely crafted logo is included in all of our plans. We even provide two options for you to choose from. We custom design your website to fit your unique brand, share your message, and attract visitors. Don't want to update your own site? We provide UNLIMITED changes with reliable turn-around times. Website design and ongoing changes are included in the monthly cost. No extra design fees or down payment. After 18 months, you own your website. Renew to get a new design or add new features and functionality. If you'd like to make your own changes, we build every site on an easy-to-use Content Management System. Your site will be designed for an optimal viewing experience across a wide range of devices. Through our dedicated hosting provider, we offer unmatched website security and speed. We routinely backup your site and update the software, security patches and plugins. Slideshows, galleries, rotators... However you want your images displayed, we can make it happen. Tabs, Lists, Accordions... We have many ways to organize and display any content you send our way. Show your events in calendar format with Google calendar integration... We’ll make sure it doesn’t look dated. It’s easier for customers to find you with a map to your business. We can even display multiple locations. From team or staff members to sponsors or testimonials, we can add people, pictures, and bios to your site. *This is not meant to be an exhaustive list of features. Instead, it is an ongoing, ever-changing list of website features that are categorized as “Included Features” and “Basic Features” according to the NOTIONCARE agreement. Features may be added or removed from this list at any time for any reason at the sole discretion of NOTION Design Group. New features requested by clients or discovered and/or developed by NOTION Design Group will be assessed as “Basic” “Pro” or “Deluxe” features at that time. This list is in no particular order of importance. We’ll setup Google’s cloud-based suite of email, calendars, etc. for you (cost of G Suite not included). If you have regular events of any kind, we can setup a system to view details and even accept payments. Display your products in an organized library. Intial entry of 20 items and training included. We can pull in frequently updated information (such as blog entries) from another site and display it on yours. Display your products in an organized library. Initial entry of 50 items and training included. Search and display a list of map plotted locations on your site. This feature is perfect for a store locator. This feature is perfect if you have a large amount of information requiring multiple online documents. We can create a searchable online space to answer questions, have conversations or make requests. We can integrate IDX Broker on your website to display MLS listed properties (cost of IDX not included). If you’re using a specific Merchant Account or Payment Gateway, we’ll integrate it into your website. We can create a multilingual website in up to 2 languages... The translated content is on you though. Offer online classes with multiple lessons, quizzes, videos, presentations, PDFs, and more. Do you provide a domain name for my website? Yes. If you don’t already own a domain name, we can purchase and cover the annual cost of 1 available domain name for as long as you are in a NOTIONCARE agreement. If you already have a domain name, we recommend leaving it where it is and we will take care of pointing it to our servers when your new website is ready to go live. Will you host my new website? Yes. Our NOTIONCARE plans cover the cost of website hosting on safe and reliable dedicated servers. We also regularly backup your website and keep your software up-to-date to avoid security breaches. I already pay for website hosting. Can I keep hosting my new site with that company? Keeping your new website safe, secure, and running efficiently is a huge priority for us. For this reason, we will not install your new website on any other servers. However, once your new website is live on our server, you can cancel your current hosting plan if it doesn’t have any other websites or email connected to it. If you have detailed questions regarding our dedicated servers and hosting, you can learn more about our award winning hosting provider here. Yes. Every NOTIONCARE plan includes the design of a custom logo for your business or nonprofit organization. We will provide you with 2 unique concepts and offer up to 3 revisions. Additional concepts and revisions are billed at our current hourly rate. We will also provide you with final logo files in multiple formats. If I don’t need a logo, do I get a discount? We do not discount the plans if you already have a logo. Our plans include logo design to keep small businesses and nonprofits from having additional expenses when building a new website. However, if you need a new logo at anytime in the 18 month term, it’s included. Because of the increasing complexity and requirements of email, we do not offer email addresses at this time. We recommend using a dedicated email service such as Google’s GSuite or Microsoft Office 365 for your organization’s email addresses. However, we will setup the necessary MX records to make your email addresses work with the outside email service of your choosing. The development time varies slightly based on which NOTIONCARE plan you choose. Our general time frame is 4-6 weeks for BASIC websites and 8-10 weeks for PRO or DELUXE websites. However, all time frames depend on the complexity of features and your responsiveness. For a more detailed explanation of our process, see our Launch Sequence. What happens at the end of the 18 month agreement? Once your 18 month agreement is complete, you own your website and all of it’s content. If you choose to move your site to another company or host provider, we’ll provide you with a backup file that contains your entire website. However, most of our clients choose to continue with one of these renewal options. Can I cancel or downgrade the agreement before the end of 18 months? There’s no option to cancel or downgrade the agreement early. This is because we distribute the cost of your initial website design and development (in addition to the unlimited changes, hosting, and backups) over 18 monthly payments, and most of the design and development happens at the beginning of the agreement term. However, you’re welcome to pay off the total amount of the agreement at any time and we will honor our commitment to provide our promised services for the remainder of the 18 months. Can I upgrade my monthly plan in the middle of my 18 month term? Yes, but because we distribute the cost of your initial website design, development, and included features for your particular plan over 18 monthly payments, you would be required to pay the difference in cost between your current plan and the upgraded plan for the months that have already passed in addition to the increased cost per month of the new plan. We do not accept check payments. All NOTIONCARE plans are set up on monthly auto pay from a valid debit or credit card. This is to avoid interruption in payment and to cover the cost of development as well as ongoing updates. Yes. We build every website using either Joomla! or WordPress, which makes it easy for you to login and make changes to your website. However, some changes are more difficult than others, and while we do provide instructional videos for certain features, we DO NOT provide website training. We do offer UNLIMITED CONTENT CHANGES as part of all of our NOTIONCARE plans. How long does it take for you to make changes to my website? After your website is live, basic updates and content revisions will be completed within 5 business days. All update requests are submitted via email unless otherwise arranged. New pages and features take longer depending on the complexity of the request. For more detailed information about revisions, see our Turnaround Times. Is there a limit to the amount of changes? There’s no limit. You can request as many basic changes as you’d like within the above turnaround times. New feature requests are limited to the plan that you are on. 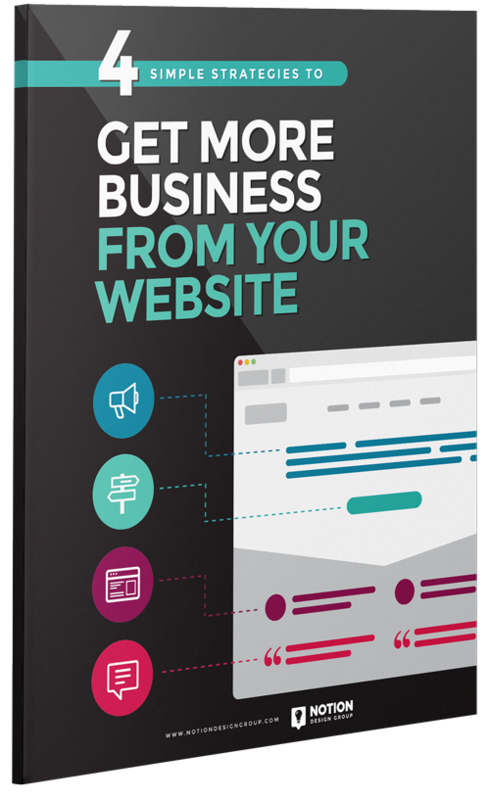 How many potential customers have you lost because your website message wasn’t clear? Do you have an outdated website that needs to be redesigned? We create websites that turn your visitors into raving fans!